"This salad is so light and refreshing. Perfect for a warm summer's day, and hearty enough for a dinner meal as well. 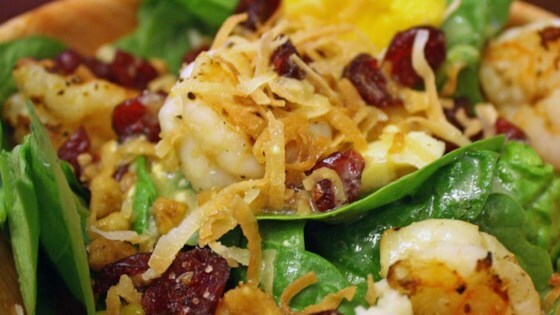 You will feel yourself transported to a tropical setting as you indulge in this yummy salad!" Prepare the salad dressing by whisking together the pineapple juice, orange juice, and 1/4 cup olive oil. Season to taste with salt and pepper; set aside. Brush the shrimp with 1 tablespoon of olive oil, and season to taste with salt and pepper; set aside. Place the spinach leaves, mango, macadamia nuts, and banana chips into a large mixing bowl. Heat a large skillet over medium-high heat. Heat the shrimp in the skillet on both sides until just warm in the center, about 1 minute per side. To assemble the salads, drizzle the spinach mixture with the salad dressing, and toss until evenly combined. Divide onto four plates. Divide the warm shrimp among the plates, and top with goat cheese. This way the goat cheese will melt down a little from the warmth of the grilled shrimp. Sprinkle with toasted coconut flakes to serve. This was tasty! I did not add the banana chips, but everything else is the same. It made a great dinner on a hot day! This salad was delicious. It was light, but yet filling. Our guests barely touched the other dishes. I cannot wait to make it again. Delicious! My husband wanted a new, yummy salad for his birthday dinner, and this was it! A new favorite, I didn't change a thing.